The Spotted Pig was closed for another 20 minutes, but the line already started for form. Going out to eat was not just a pastime; it was a quest. Under the modern veneer of civility lay the hunting instincts older than humanity itself. My husband and I were the tourists intruding on New Yorkers’ turf. The couple who got here early enough to claim the one bench in front of the restaurant was not new at this game. Although it wasn’t even 11am on a lazy sunday morning, the Spotted Pig burger wasn’t their first culinary pray. “We’ve been up since 6am waiting for cronuts,” said the woman. I am not usually one to be stumped by unfamiliar ingredients. But that’s one nut I haven’t heard of before. “What’s a cronut,” I asked innocently. The woman’s eyes widened in surprise. She probably wondered what planet I was visiting from. “A cronut. It was all over the New York Times. Haven’t you heard? A croissant donut.” I was trying very hard to imagine what a deep-fried croissant would be like, but couldn’t get past the image of a deep-fried stick of butter. “Was it good?” I asked. “Yes! It’s completely revolutionary. It has a filling and a glaze and you’d think it would be too much, but it’s not. It’s just perfect.” “Does the bakery open at 6pm on a sunday?” I asked. Being from Boston, I had to wait till 9am for my sunday coffee and croissant, so 6am opening time seemed like a dream. “Oh, no,” said the woman. “The bakery opens at 9am, but 6am is when the line starts to form. They only bake so many. If you are not there early, you can get other baked goods, but not the cronuts.” The Spotted Pig finally opened and we went inside. As we opened our menus, my husband and I looked at each other silently asking the same question: “Would you stand in line for 3 hours to get a deep-fried croissant?” Simultaneously we shook our heads. No, we wouldn’t. “Will we get the real cronuts?” asked Sammy, my 9 year old daughter when she heard I was taking her to New York to see Matilda the Musical. In the 5 years since I first heard about them, cronuts became as ubiquitous as pesto. 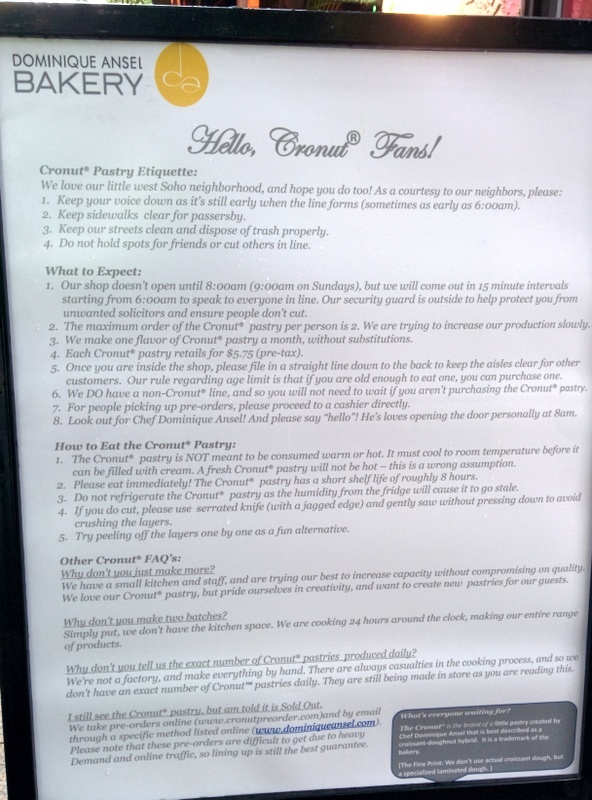 No one could call them “cronuts” since Dominique Ansel got a copyright on the term. Whole Foods and Dunkin Donuts had to settle on selling way less cool sounding “croissant donuts.” Having tried the forgery and not finding it satisfactory, Sammy wanted to try the real deal. 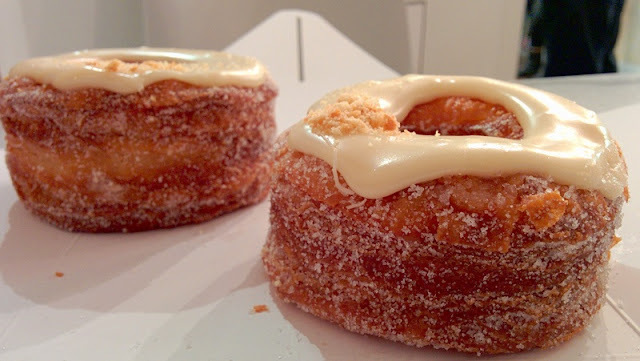 Was 5 cronut years enough to eliminate the lines? Not exactly. But according to yelp, a cronut could be yours in as little as 30 minutes. Emboldened by this information, we set out from out Tribeca Hotel on a damp October sunday mornings using our phone’s GPS to guide us to the cronuts with the scheduled arrival time of 5 minutes before DA opened. “Are we there yet?” asked Sammy. I was about to say, “Not yet dear, still a few block,” when I saw the colorful caterpillar of umbrellas stretching around the corner. “Yes kiddo, we’ve arrived,” I said as our green umbrella extended the caterpillar's tail. I kept trying to be optimistic. The bakery would open in 5 minutes, and we’d all go inside, right? Something told me that wasn’t going to happen given the length of the line. We turned to the family behind us to ask how it worked. They had no idea. Like us, they were from Boston. We turned to the couple in front of us. They had no idea either. They were from Scotland. Suddenly, the line started moving forward rather quickly. Sammy and I looked at each other excitedly. The line stopped. We waited for 10 minutes. We expected to be progressing at least a little every few minutes, but that didn’t happen. I heard a gentleman behind us say that he stood in this line yesterday, but the cronuts ran out before he got inside. Is that what happened now? How many cronuts did they bake? 50? 100? I was trying to do the cronut arithmetic in my head when the line moved again and stopped again. I left Sammy to hold our place in line and went to the front of the line to investigate. Turned out the line was for cronuts only. For all the other baked goods, you could just walk in. Every 15 minutes of so, a Dominique Ansel representative came out and ushered a new group of lucky cronut seekers inside. I came back to Sammy and asked if she wanted to forget the line and get something else. She said she’d wait. We kept asking each other the same question every 10 minutes for the next 40 minutes. Each time we decided to wait. I didn’t want to disappoint Sammy by quitting, and she didn’t want to disappoint me. To pass the time, I got out my kindle and read Harry Potter to her outloud. Finally we were on the finish line. We were cronut seekers number 3 and 4 in the next group to go into the holy of the holies. Cronut seekers number 1 and 2 were the Scottish couple whose wait in line was made extra trying by having to listen to my sad attempts at Hagrid’s accent. We were close enough to read the board of cronut rules. I thought we should take the rules seriously, so that after waiting for an hour we wouldn’t get disqualified due to some technicality. “The cronuts need to be eaten immediately. The cronuts can’t be microwaved. The cronuts can only be cut with a serrated knife. The voices in line had to be kept low not to disturb the residents of this neighborhood. “ Suddenly I saw an orange box being offered to me. It had the letters D and A on it. “You are in line for cronuts, aren’t you?” said the woman smiling at me. “Here, these are for you.” I stood there speechless thinking it was a hallucination. It was 10am and I was in desperate need of coffee. But could I be that deranged? “They allow 2 cronuts per person,” she explained. She pointed to a man holding the other box. “Between 2 of us, we got 4 cronuts, but we only want 2. Here, these are for you and your girl.” I started blabbering my gratitude, but couldn’t find the words, so I gave the woman a hug. I fumbled for my wallet, but our cronut angel wouldn’t take any money. I felt guilty that we were offered the cronuts and not the Scottish couple that was in line before us. I offered them the cronuts, but they wouldn’t hear of it. Sammy and I ran inside the bakery and opened the box. We took a picture of our loot and dug in. It was hard for our overexcited brains to digest what we were tasting. There was sugar. Lots of it. First in the form of a dense fondant covering the top of the cronut, then in the form of granules coating the whole cronut, and finally in some fruity form inside the cronut, which turned out to be banana cream. I wasn’t sure what to think, so I walked up to the register with absolutely no one in front of me and asked for a chocolate croissant and a coffee. The croissant was a living, breathing creature, exhaling its buttery perfume with each bite. I took another bite of the cronut. It was not living or breathing. If felt like a mummified croissant preserved in hot oil and sugar for eternity. Sammy and I peeled off the top layer containing the dense fondant and took another bite. The cronut seemed better, but it never came to life. I felt awful that we didn’t start with just one cronut. If we left one intact, I could have made some soul in the end of the line so happy. I felt cronut guilt. To distract myself, I focused on the chocolate croissant, which was indeed excellent. We finished the chapter of Harry Potter and headed to our next destination, the Spotted Pig.